We recommend accessing the program on a desktop, laptop, or mobile telephone device and not using Internet Explorer. If using a tablet (e.g., iPad) the platform will require that you go through additional steps to access the program. Note: If you have previously registered for one of the self-paced educational programs please use the same username and password to login. If you cannot remember your username, please send an email to education@rainn.org. Copy and paste this link into your browser: https://safehelpline.rainntrain.org On the login page (see screenshot below) click "register here" on the right-hand side of the page to create a new account. You will then be asked to provide a first and last name, email address, and create a username and password of your choice. Once you enter your username and password, click "create account" at the bottom of the page. You do not need to include information on local time zone, company, address, or phone numbers. 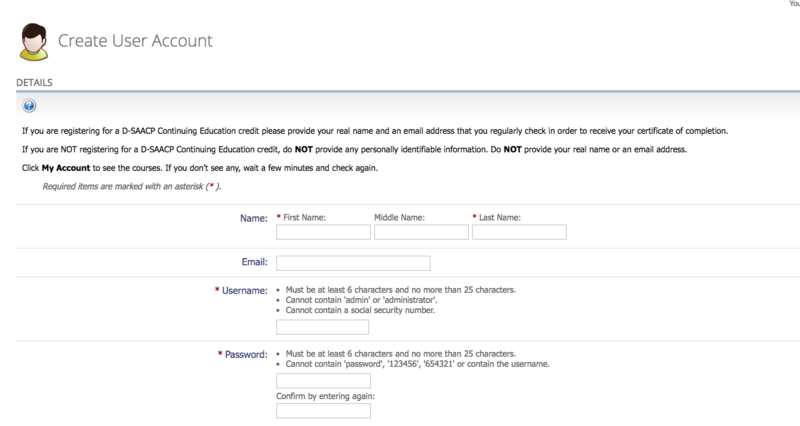 After clicking "create account," you will then be directed to a "registration complete" page. Click "Continue" and then "My Account" at the top of the page. Once on the "My Account" page, click the "Enrolled" tab where the selection of programs will be listed. Select “My Account” to see the programs you are enrolled in. Click “Go” to start the program. If you have registered your email address to receive D-SAACP Continuing Education Credit, you will automatically receive a proof of completion certificate for one hour of D-SAACP credit upon completion of the program. If your certificate does not automatically generate, please email education@rainn.org.